of Stebbins and Handy, Architects, Minneapolis, Minn. 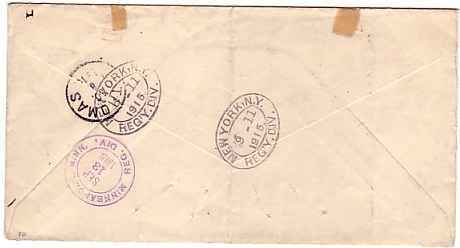 It was mailed in Road Town, Tortola, Virgin Islands. Road Town is the capital of the Virgin Islands. American Virgin Islands, formerly the Danish Virgin Islands. There are two Road Town CDS. and stamping a large REGISTERED on the front. The cover then went to St. Thomas in the Danish West Indies. It wasn't until 1917 that the Danish West Indies were purchased by the United States. given a boxed registry handstamp, and a new serial number. There is also a St. Thomas circular handstamp on the back. by two oval NEW YORK, N.Y. | REG'Y. DIV. handstamps dated September 11. It was also given a new serial number - 1601 - by a handstamp just below the address. where it given a blue CDS for the REG. DIV. dated September 13. 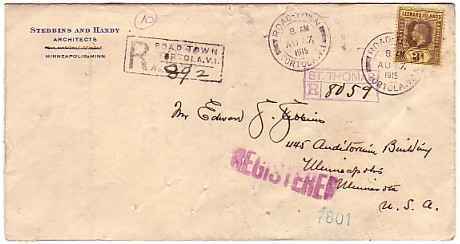 The cover is franked with a 1913 George V 3d. purple on yellow paper (SG 51). Note: I am not absolutely certain about the date. It could be August 7 with St. Thomas transit on August 8. The 17/18 seems more consistent with arrival in New York on September 11.